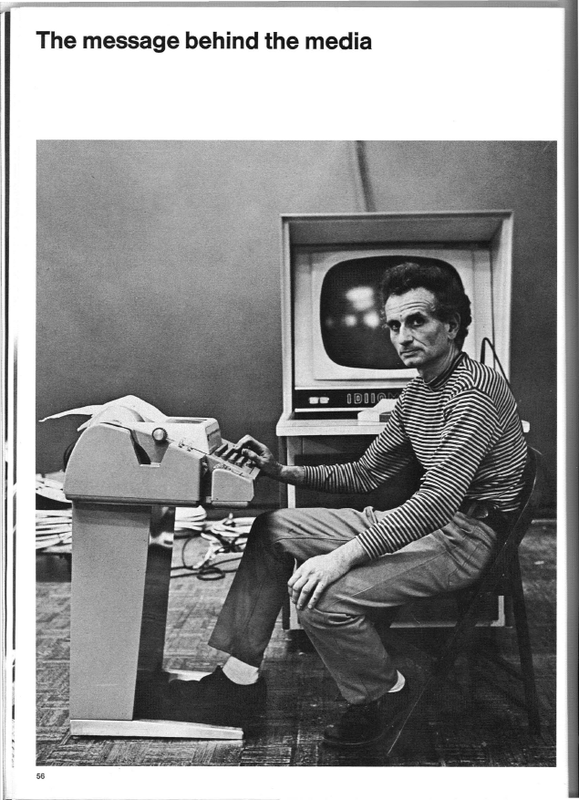 A collection of examples from the Prosthetic Knowledge Tumblr archive and around the web on creative projects and installations which employ the typewriter as part of the work. The typewriter installation «On Journalism #2 Typewriter» writes generatively constructed stories about all journalist who have been killed worldwide between 1992 and today based on the existing data of their lives as well as their published work. The individual stories are connected through common fields of coverage, places, professions and many other aspects. Besides the text the typewriter creates also images e.g. flags which are heavier distorted the more journalists got killed in that particular country. The story is written endlessly on one endless piece of paper. From Letters Are My Friends in Berlin comes an installation that enables you to experience their animated and generated Buchstabengewitter Typeface with a haptic tactile interface - an old Rheinmetall Typewriter from the 1920s. We used the Arduino based USB Typewriter Kit by Jack Zylkin to convert this machine into an USB keyboard and give it a long deserved upgrade after almost a century. The keys are send to a PC that is running the Buchstabengewitter vvvv-patch that animates the glyphs. We gonna use it as a realtime comment tool for talks and events. Introducing the Automatypewriter, a new way to experience interactive fiction! It’s still a little rough around the edges (in particular, you can see that the spacebar sticks a little, and the whole thing needs to be tidied up), but you get the idea: the Automatypewriter is a typewriter that can type on its own, as well as detect what you type on it. By reading what it types to you and responding, it can be used interactively to play a game or participate in a story (in this case, Zork). decide them to be. Since such decisional cues often occur in relational groupings or sets the matrix was named after George Boole, the originator of set theory. ... Computer realizations displayed on the scopes in this exhibition are based upon Boolean Images whose decisional cues are alphanumerical. The computer can most easily sense this type of cue and convert it into the decisions of the artist, programmer, audience-collective. Boolean Images may not be immediately perceivable. 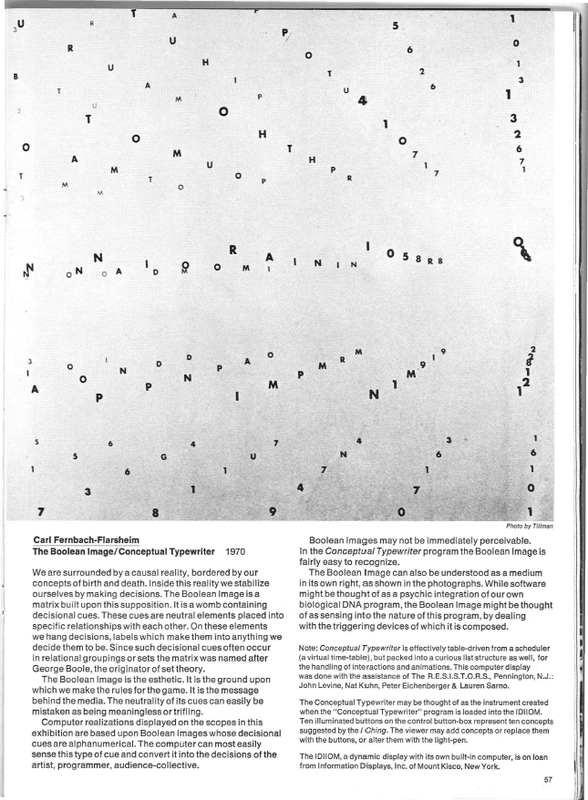 In the Conceptual Typewriter program the Boolean Image is fairly easy to recognize. You can find out more about the SOFTWARE exhibition guide here.